2009 Eduardo Blanco Alvarez, All rights reserved. Sizes: 51 cm wide x 34.5 cm high. 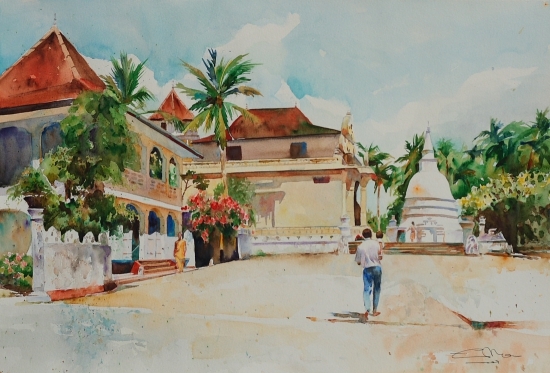 original and unique watercolor Colombo, capital of Sri Lanka. Normally shipped 3-5 days since actual payment. Sizes: 51 cm x 34.5 cm. Complete the form below to contact "Eduardo Blanco Alvarez" (Artenet receive a copy of the message). ADD TO CAR "Colombo, Sri Lanka"
If you are interested or want more information about this work, please contact "Eduardo Blanco Alvarez" (Artenet receive a copy of the message). Verified icon indicates Artist "Eduardo Blanco Álvarez" It has successfully completed the verification system to establish their identity Artenet us. It also provides the highest level of customer with quick delivery service.